Let IT Consulting Companies Handle IT While You Do Other Things! There just aren’t enough hours in the day, right? Well, that may be the case for most companies. But businesses who outsource their information technology work to IT consulting companies benefit from great service as well as a whole lot more valuable free time. Here are 10 things you and your team can do with your free time once you outsource your IT needs. Perhaps the best reason to outsource your IT needs is so that you and your team can focus on growing your business. You’ll have hours of extra time to get with your team and come up with better ways to serve your customers. Speaking of customers, customer retention is one of the most integral aspects of owning a business. Yet most small businesses lack the resources needed to meet their customers’ needs fully. Let your new IT partners worry about the technical side while you focus on what’s most important. A small business is only as strong as its team. In fact, Forbes suggests that team building is the most important investment a business owner can make. Schedule some exciting team-building exercises or a fun team outing to reward your employees for their hard work and dedication. Less time struggling to keep your website online means more time to watch your business succeed. Use this extra time to re-evaluate your marketing goals and determine whether your team is meeting them. This extra time may just save your current marketing campaign. Let’s say you spend an hour per day working on your tech needs. That hour per day could really benefit your health. And studies show that those who exercise often see improved performance at work! It’s a win-win scenario. Why not let your team in on the fun, too? You could sign up as a group at a local gym or take a group fitness class before or after work. With all of this extra time, it can seem like work can’t get any easier than it already is. But automating tasks can make mundane tasks faster than ever. Consider learning how you can automate your most disliked tasks. You’ll have even more time for work and may learn some exciting programming skills along the way. Our work environments have a substantial impact on our work performance. So if you and your team are going crazy staring at the same egg white walls day in and day out, it may be time for a makeover. Bring in some new furniture, paint the office, or add a few plants to liven up your workspace. Business branding is more important than ever. Build and promote your social media and general web presence to interact with your customers in a whole new way. Best of all, effective branding can improve your company’s search engine optimization efforts. You’ll be at the top of Google before you even know it. Finally, don’t forget to stop and smell the roses every now and again. Small business outsourcing lets you have more time to do whatever you want to do — even if that means chatting with your co-workers or focusing on your mindfulness. 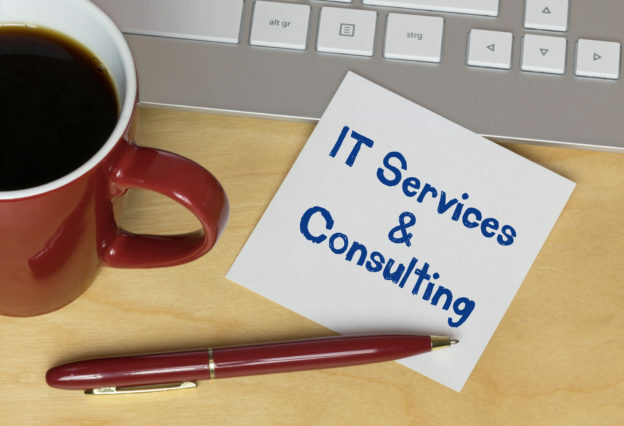 Partnering with IT consulting companies is a great move for small businesses in any industry. As you can see, the extra time you gain from outsourcing these basic services can be used for a variety of activities that can positively benefit your business, yourself, and those around you. So what are you waiting for? It’s time to take control of your workday. Get in touch and see how you can outsource your IT needs.